I know it’s only February, and we can’t expect too much sunshine at this time of the year in the UK; we’ve been lucky – we’ve had relatively mild weather so far this winter, and some days we’ve even had clear blue skies and bright sunlight! Glorious! But this afternoon has been horrible; we’ve had icy winds, sleet and hailstones – one of those bleak, miserable, grey days that just makes me pine for warm sun, blue skies and….well, a bit of colour. Anything but grey! As the wind howls through the trees outside, and dark clouds race across the sky above muddy brown fields, I remind myself that this time last year I was planning a break to Morocco. 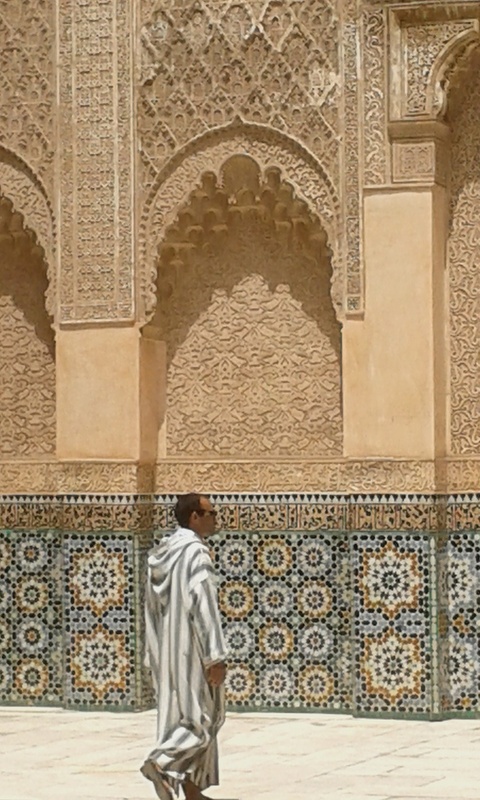 Morocco is anything (and everything) BUT grey. 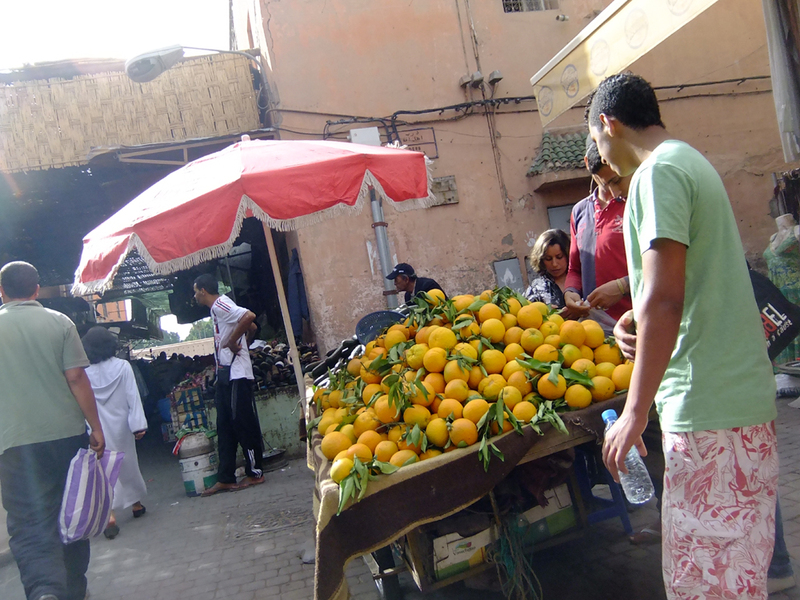 Morocco attacks the senses like …..a charging camel, a sandstorm, an explosion in a spice factory; the moment you step into the streets you are bombarded with the sound of car horns and people shouting, the smell of spices and donkeys, the searing sensation of the sun burning your pale skin. And colour everywhere. 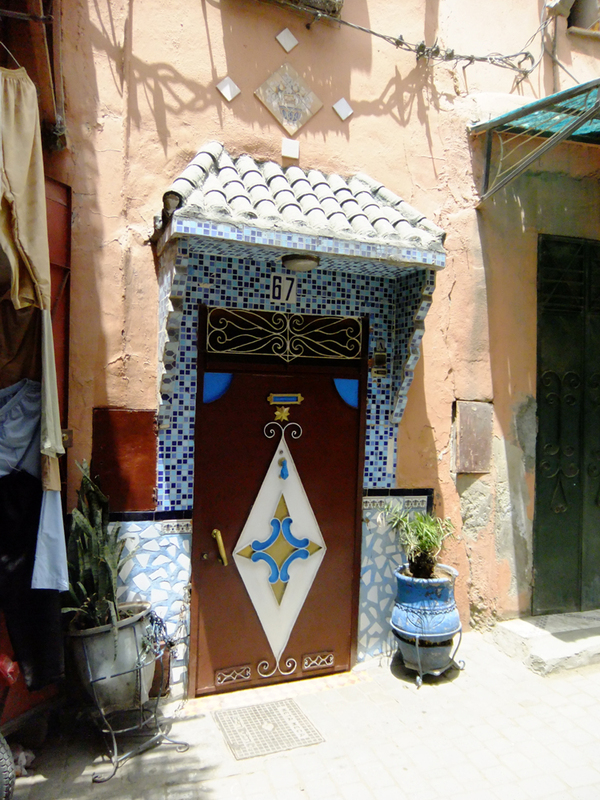 Even the ‘dull’ colours in Morocco are stunning. Many of the ochre-coloured buildings have a pinky-orange tinge to them, which glows as the sun starts to set. 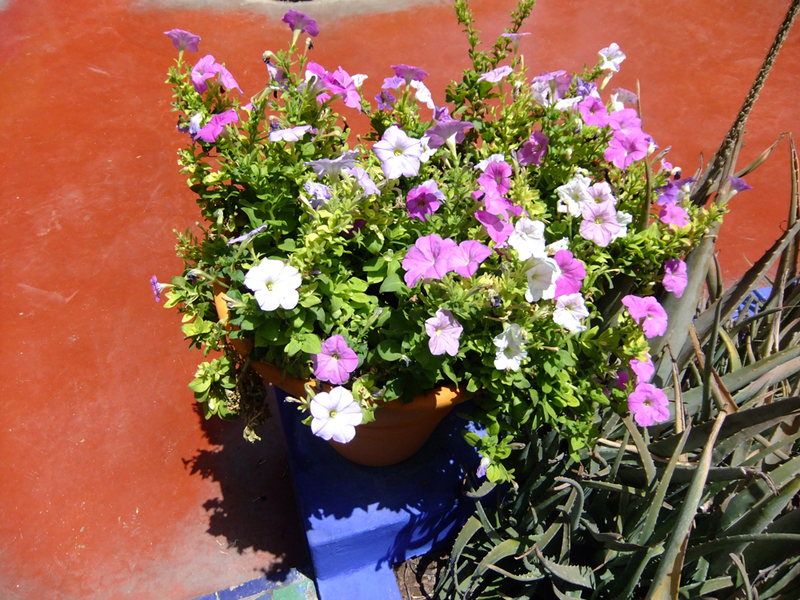 Vibrant flowers spill from pots on rooftops and vivid tiles decorate doorways, adding bursts of clashing colour to the warm walls. 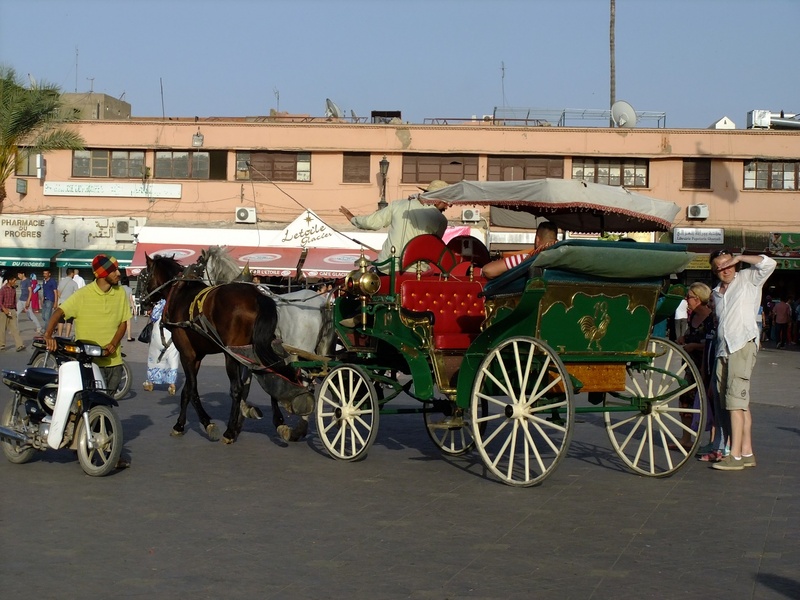 The sun casts sharp shadows, so a row of sand-coloured buildings is punctuated with contrasting dark shapes. Shops and market stalls spill out onto the roads, displaying their wares on every possible surface – cumin, paprika, cinnamon piled high on wooden trays, scarves and carpets hanging from rails, babouches (leather slippers) in rainbow colours on racks against the walls, silver jewellery, copper pans, candles, perfumes….we even saw a huge tray in which about 40 live chicks, all dyed pink, green, blue and yellow, squeaked and flapped tiny wings. Black and green olives, lemons, oranges and dates are everywhere. Bottles filled with colourful oils and potions line shop windows, many decorated with brightly coloured tassels hanging from the stoppers. 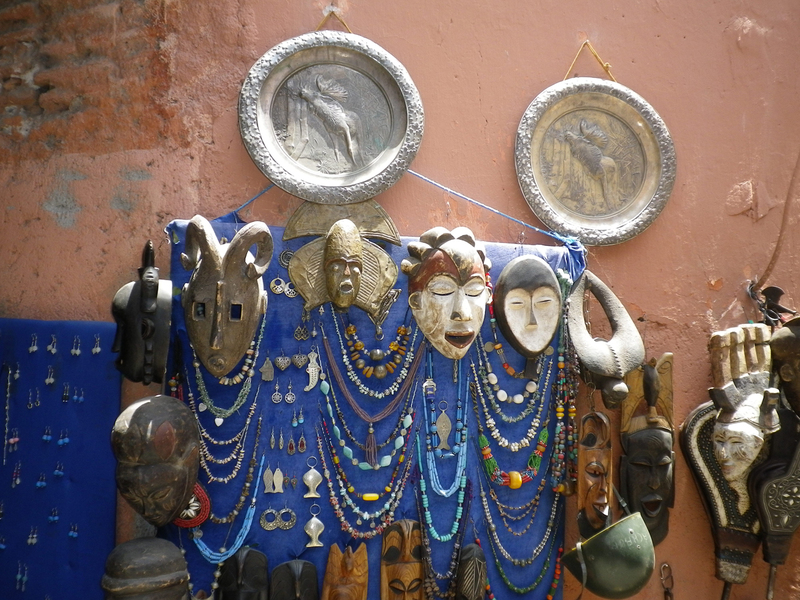 Soft leather bags and purses, ceramic pots, hand made bangles and bracelets catch your eyes from every nook and cranny. Blossoms and fruit sit among rich green leaves on trees whose gently swaying branches make dappled patterns on dusty tiled paths. 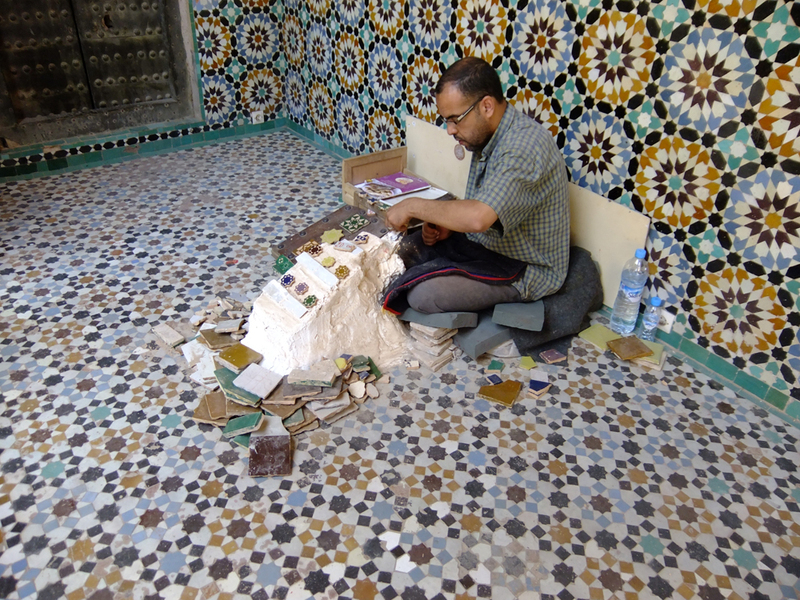 The Medersa Ben Youssef was founded in the 14th century as a place of religious learning. 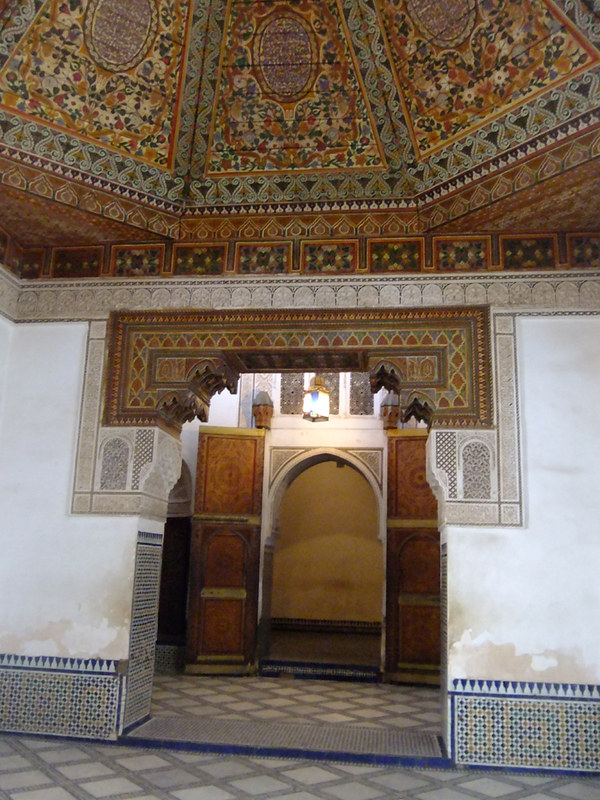 It was rebuilt around 1565 by the Saadian sultan Moulay Abdellah, and you can wander through this beautiful building and see the 130 dormitory cells where 900 young students studied the Koran. But it’s most famous for all the wonderful examples of traditional architectural details throughout the buildings and courtyards. 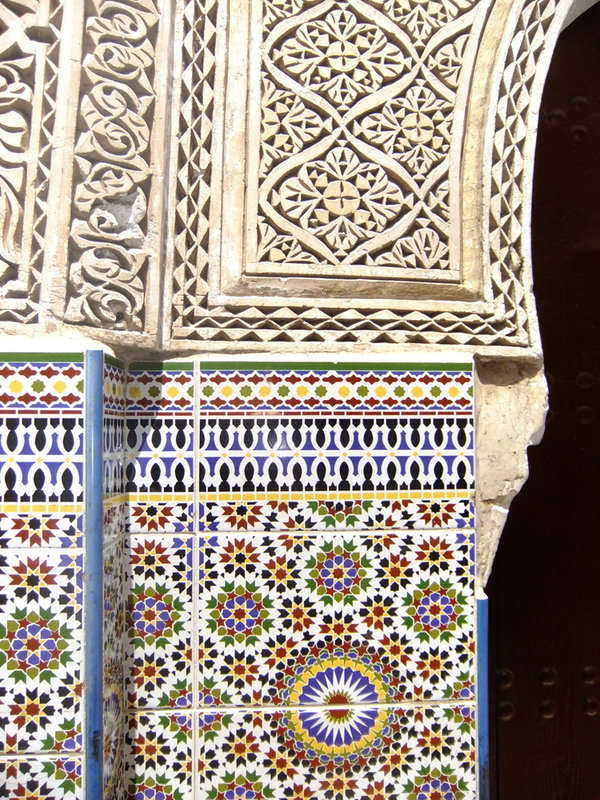 As well as the carved stucco panels on the walls and the ornate arches and pillars, the lower sections of the walls in the courtyard are covered with zellij tiles – multi-coloured tiles laid out in complicated geometric patterns. The students’ dormitories are small and sparse. Most contain two to four alcoves cut into the stone walls in which the students would sleep – presumably with some sort of thin mattress for comfort. 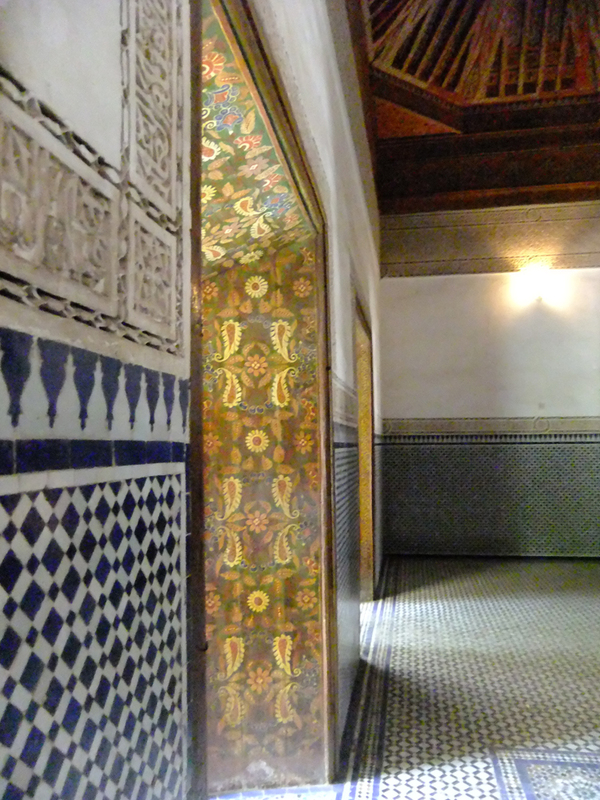 The rooms are completely bare, although the floors of the corridors between the rooms are decorated once again with brightly patterned tiles. 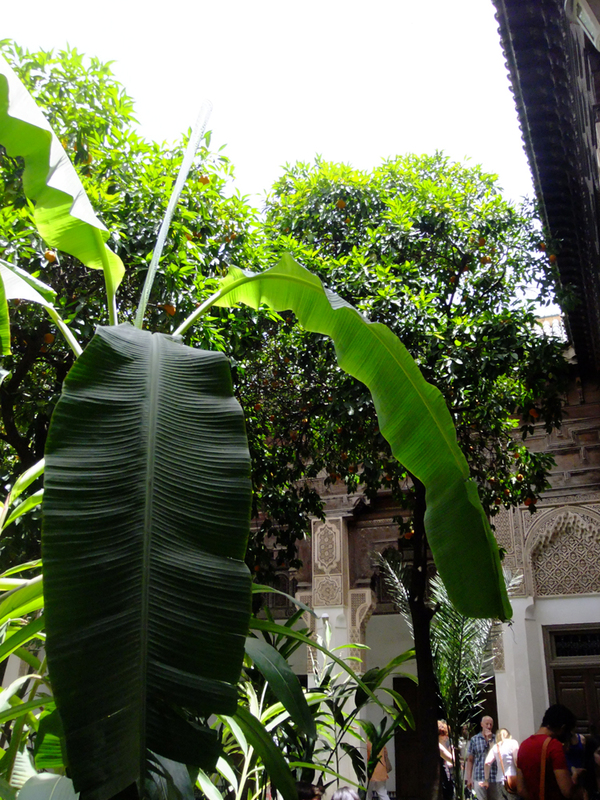 The thick walls help to keep the building relatively cool, and the hustle and bustle of the Medina just outside seems far away. The mixture of plain white plaster and areas of brilliantly coloured tiles and paintwork is stunning – monk-like simplicity blended with the exotic feel of a harem! 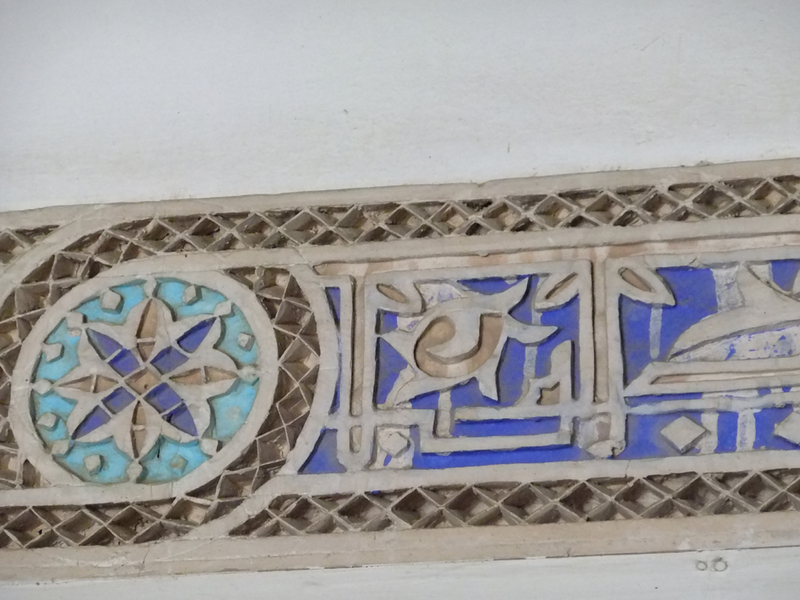 I found the same sense of exotic tranquility in the beautiful Bahia Palace, built in the 19th century for Ahmed Ibn Moussa, who brought in craftsmen from Fez to create a home for his concubines. 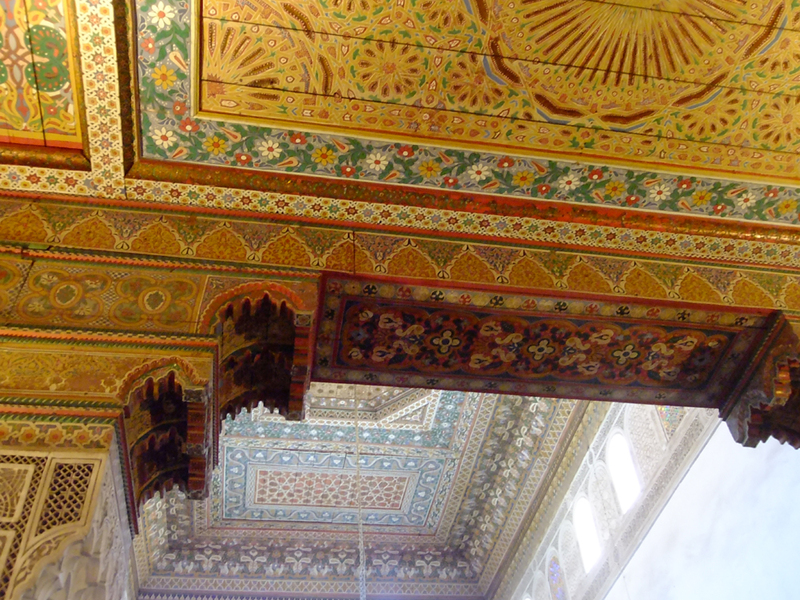 The name means ‘Palace of the Beautiful’, and the 160 rooms are lavishly and colourfully decorated. 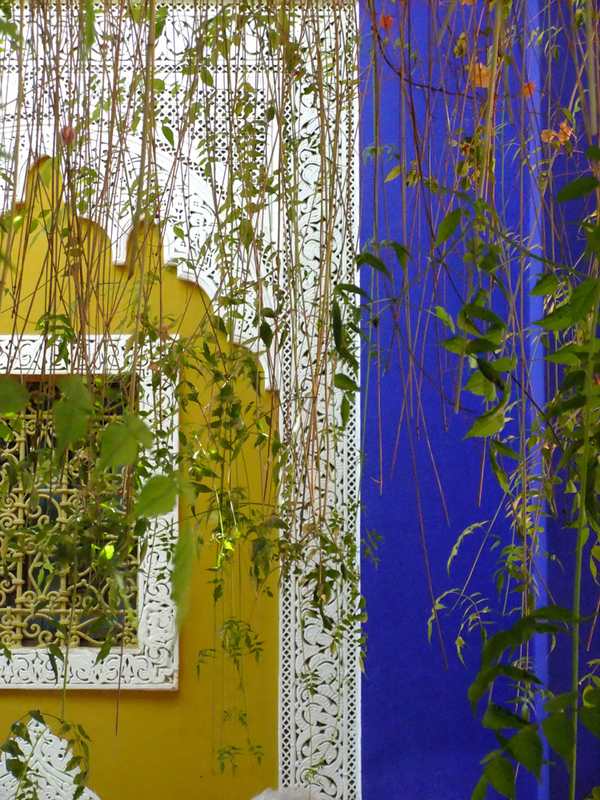 Ceilings in particular are intricately painted in jewel colours, and windows and doorways look out onto pretty, cool courtyards with marble fountains, ponds and rich green foliage. 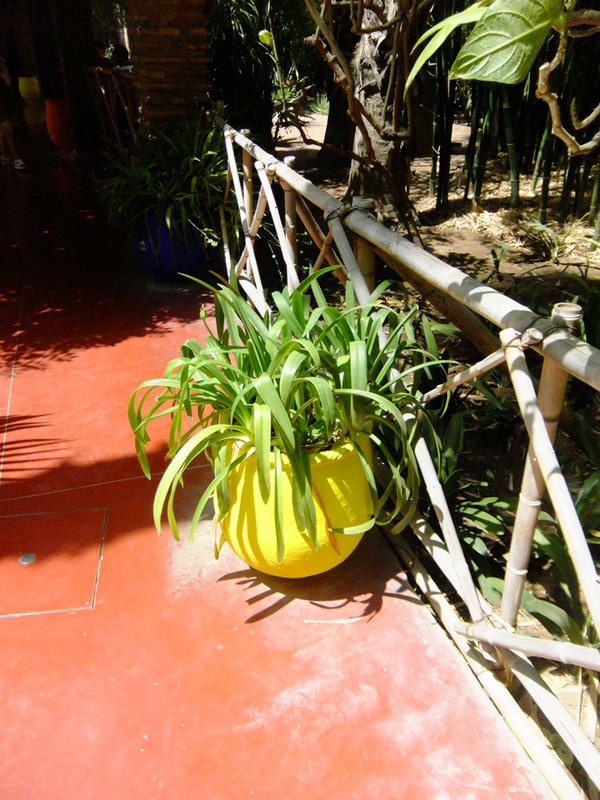 It’s amazing what a difference a little greenery and running water makes – you instantly feel refreshed and a little calmer! 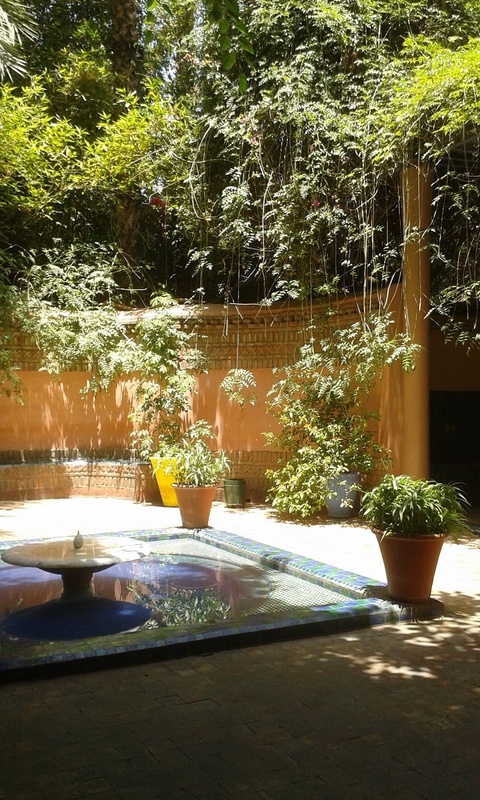 I loved the courtyard in the Bahia Palace; it felt like a scene straight out of ‘One Thousand and One Nights’, with the cool marble, the fountains, the dazzling colours of the tiles and the paintwork. 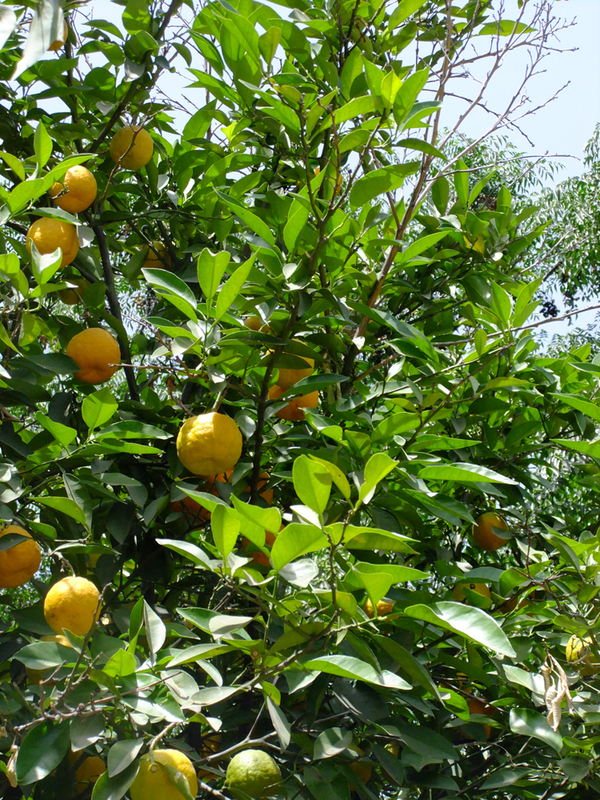 Around the Palace are beautiful gardens with orange and lemon trees, palms and rose bushes. Several cats lay sprawled in the dappled shade beneath the trees, ignoring the tourists and the tiny birds that flit around in the branches. 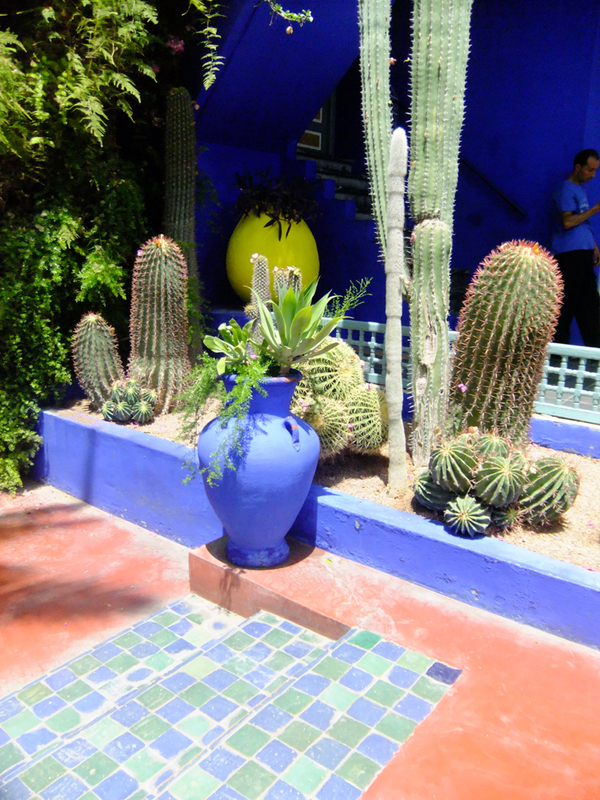 No visit to Marrakech would be complete without a visit to the famous Majorelle Gardens. This amazing space is in every Marrakech guide book’s Top Ten, although prior to our visit, I wasn’t too sure that I’d enjoy it; the photos I’d seen showed beautiful colours and lots of cacti and palms, but it all looked somehow a bit arid and modern – not the ancient, busy, bustling Middle Eastern mish-mash that I expected of Marrakech. 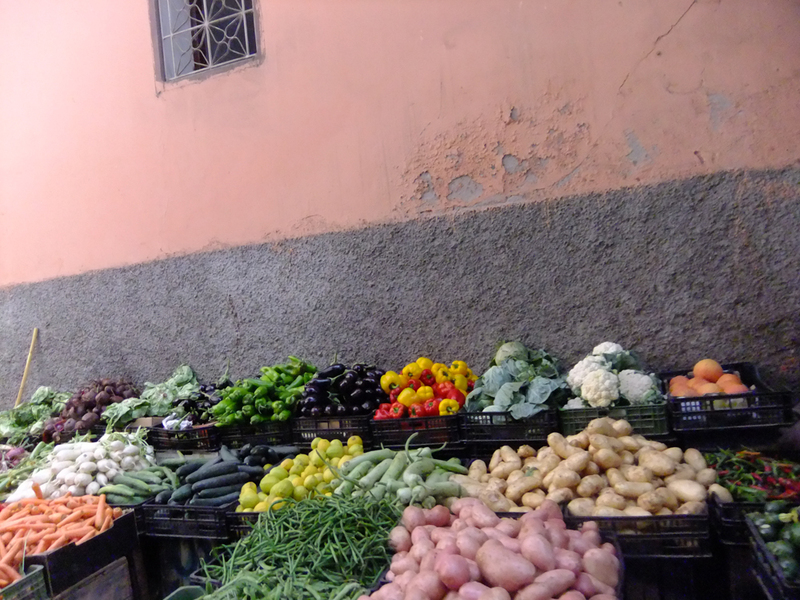 But it gave us an excuse to wander into the New City, and in spite of getting completely lost (for about two hours, at the hottest time of day…), we finally found this colourful oasis in the middle of the town. 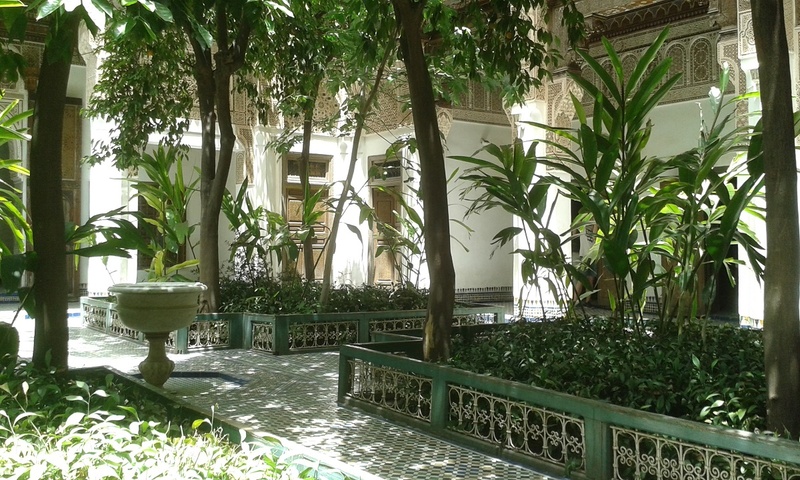 The shady little courtyard at the entrance is gorgeous; we’d have happily just sat there for hours, enjoying a rest in the dappled coolness, but through the gates we could see tantalising glimpses of the gardens beyond. 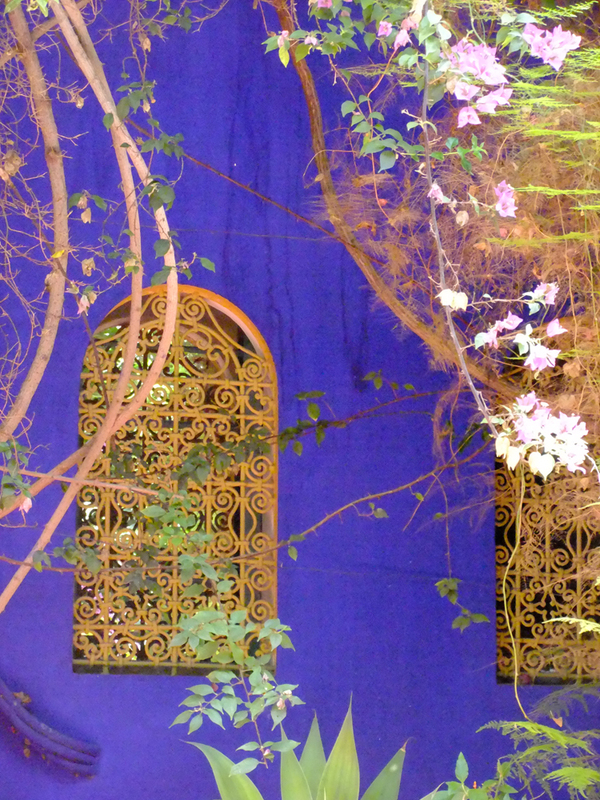 The 4-acre plot was bought by French artist Jacques Majorelle soon after he arrived in Morocco with his wife in 1917. 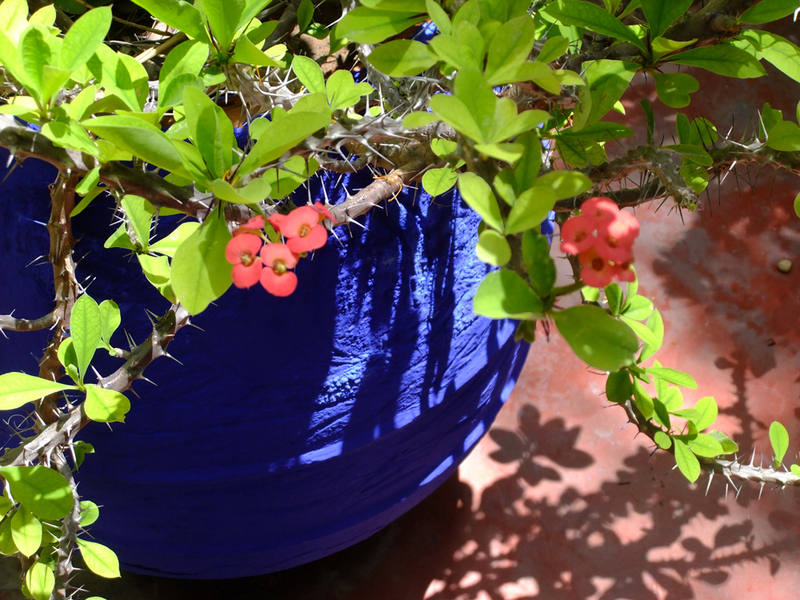 His passion for botany led him to fill the gardens with plants that he brought back from his travels around the world, looking for inspiration for his paintings. In 1931 he commissioned a cubist villa to be built in the gardens, which he used as a studio and workshop. 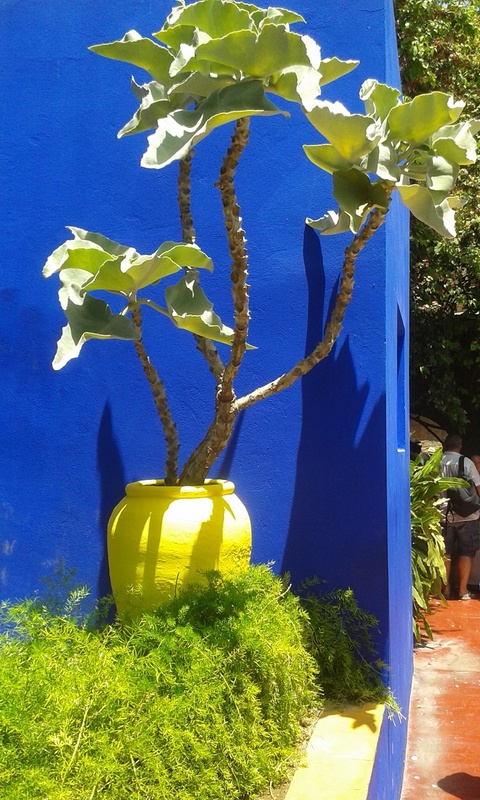 He continued to lavish attention on the gardens between paintings, composing plants, trees and ponds into works of art, and using strong, vivid paints (including the brilliant cobalt blue known as Majorelle Blue) on the walls and plant pots. 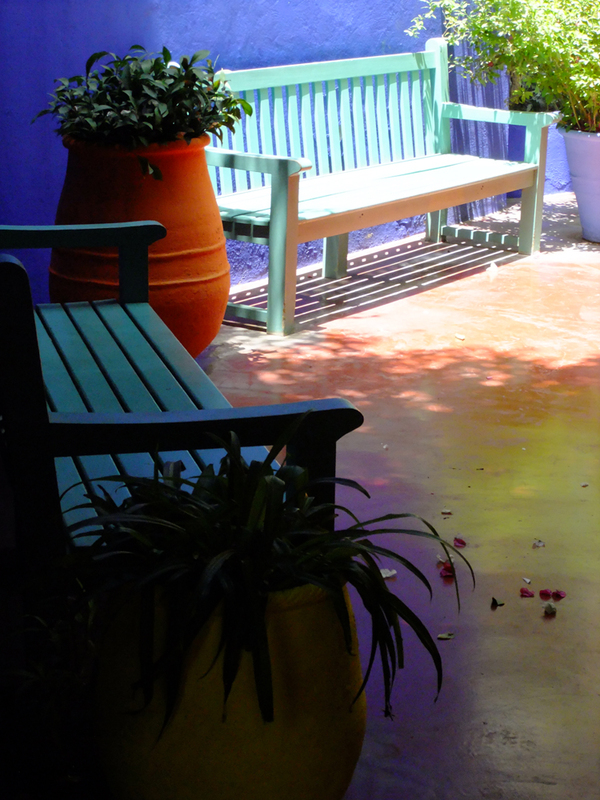 Following his divorce – and then finding a new partner – Majorelle had a serious car accident in 1956, which led to the amputation of his left leg; he was forced to sell off part of the gardens to raise some money, but after a second accident just months later, he was sent to France to recover. 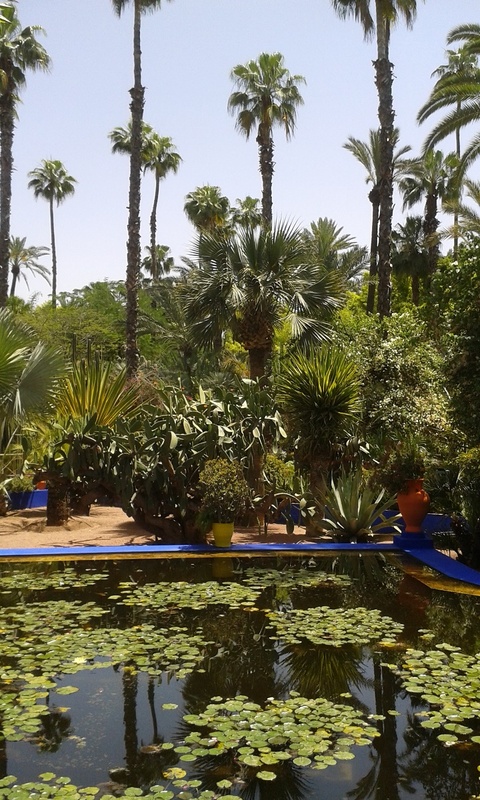 He died there in 1962, never seeing his beloved Marrakech or his beautiful gardens again. 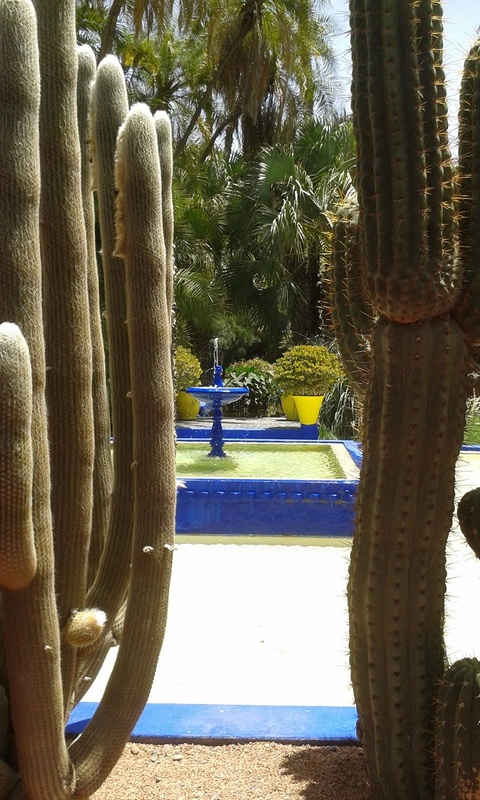 The famous fashion designer, Yves Saint-Laurent, and his partner Pierre Bergé fell in love with the now dilapidated and overgrown gardens when they first visited Marrakech in 1966. The land was due to be bulldozed to make way for a hotel, but Saint-Laurent managed to prevent this, and the couple bought the gardens in 1980. 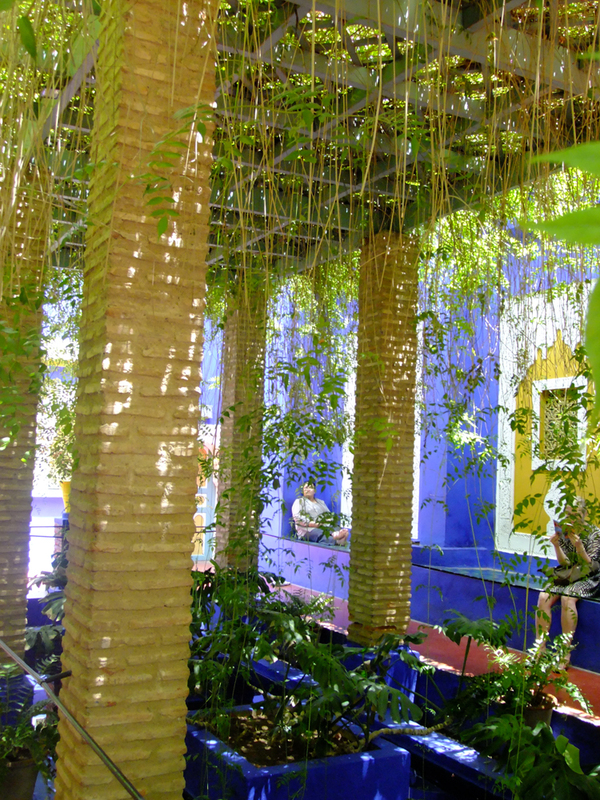 They set about restoring Majorelle’s vision, installing complicated irrigation systems, adding new plants (there are now 300 different species) and employing 20 gardeners. 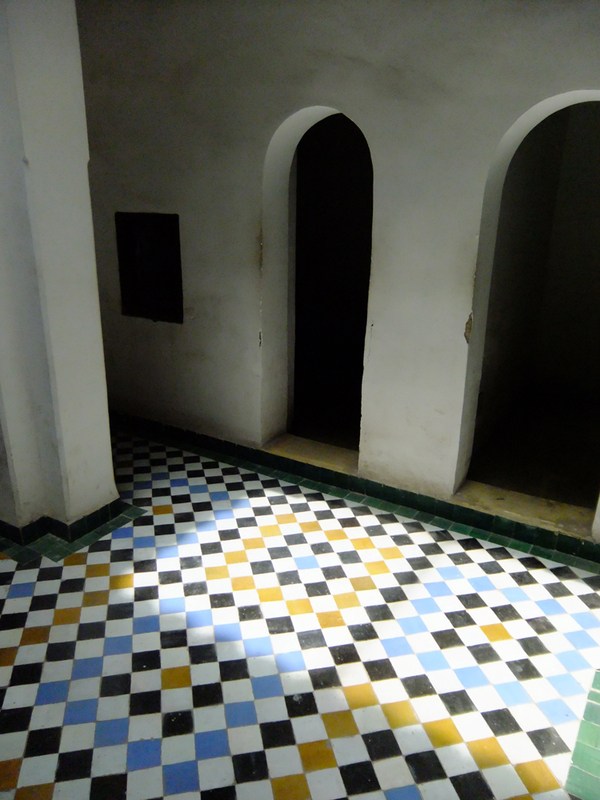 The cubist villa now houses a Berber museum. 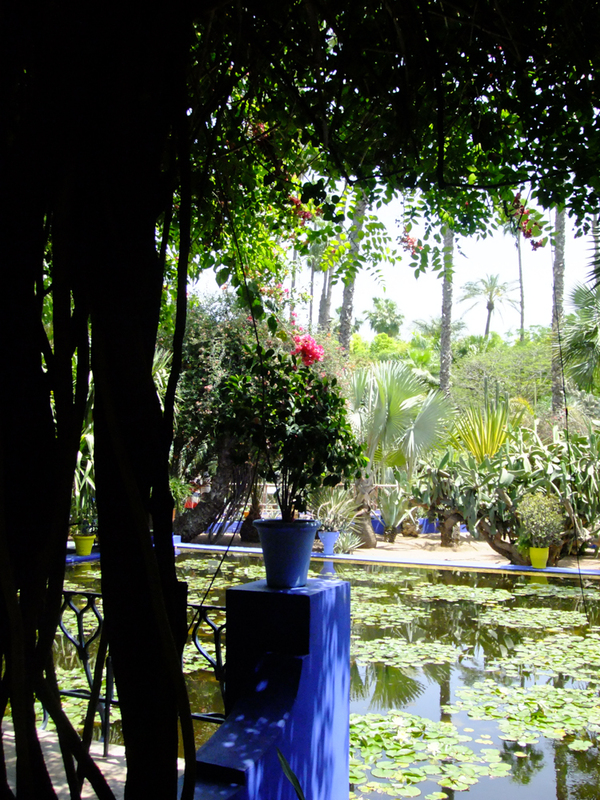 When Saint-Laurent died in 2008, his ashes were scattered over the rose garden, and a pillar brought from Tangiers stands as his memorial, surrounded by palm trees and bamboo. 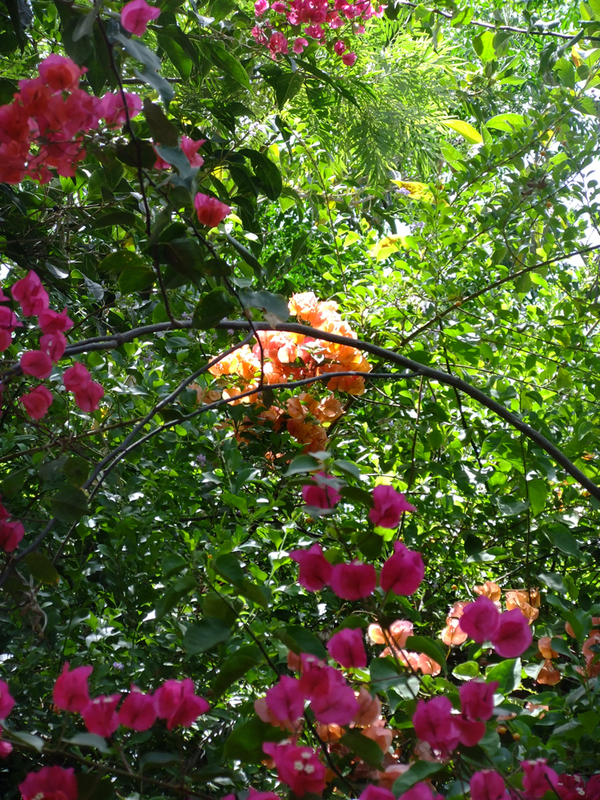 As well as the stunning plants and flowers, the gardens are home to chirruping small birds and cooing doves, humming bees and croaking frogs. Butterflies flit above the blossoms, and water trickles from fountains and over stones. 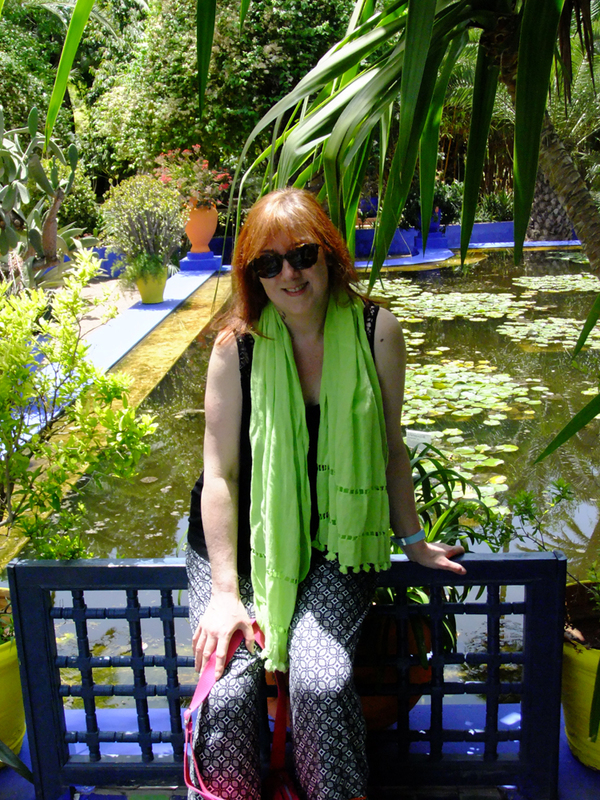 It’s a world away from the harsh, dry tourist trap I’d expected; the Moroccan sun beats down, accentuating the bright colours and stark shadows, but you can also find lush, green avenues and cool, shaded benches; little wooden bridges looking out over still, lily-covered ponds, and tranquil pergolas draped with leafy green fronds. Bliss! 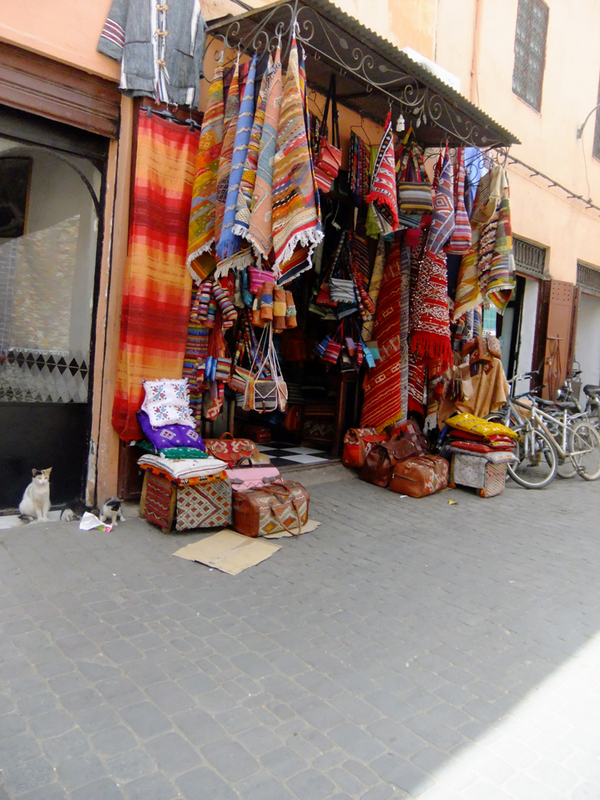 Back in England, opening the curtains just after dawn onto another cold, grey English winter morning, I try to remember those scorching, mind-melting days in Marrakech….the smells, the sounds….but most of all, the incredibly vibrant colours….